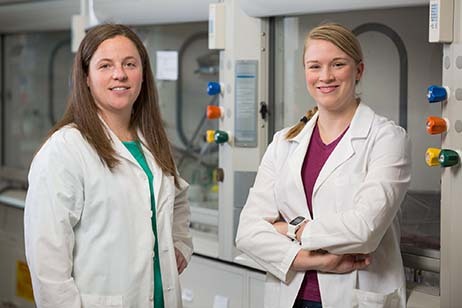 University of Arkansas graduates McKinzie Fruchtl (left) and Ellen Brune form the core of the start-up company Boston Mountain Biotech. FAYETTEVILLE, Ark. – The U.S. Patent and Trademark Office has issued a full patent for a protein manufacturing technology that was developed in part through research at the University of Arkansas. The new method will simplify the pharmaceutical production of proteins used in drugs that treat a variety of diseases and health conditions, said Ellen Brune, a 2013 graduate of the University of Arkansas whose start-up company, Boston Mountain Biotech, is marketing the method. The patent, titled “Separatome-based Protein Expression and Purification Platform,” was assigned to the board of trustees of the University of Arkansas and the University of Pittsburgh. Boston Mountain Biotech – a Genesis Technology Incubator client at the Arkansas Research and Technology Park – holds the exclusive license to market the trademarked Lotus purification platform. In addition to Brune, other inventors named on the patent are Bob Beitle, professor of chemical engineering and associate vice provost for research and economic development at the U of A; Ralph Henry, Distinguished Professor of biological sciences at the U of A; Mohammad Ataai, professor of chemical engineering at the University of Pittsburgh; and Patrick Bartlow, a scientist at Janssen Research and Development, a subsidiary of Johnson & Johnson. Brune conducted research at the university as a Doctoral Academy Fellow, where she created a series of custom strains of the bacteria Escherichia coli that produce minimized sets of contaminants or “nuisance” proteins. In the laboratory, Brune worked under the direction of Beitle, one of several researchers have been investigating the problem of cells wasting resources to make contaminants that then have to be removed from the final product. Brune designed custom strains of “Lotus” E. coli, which refer to a suite of cell lines optimized to work with specific separation techniques and characteristics. Brune accomplished this through bio-separation and genetic manipulation, specifically by removing the sections of DNA that code for the contaminant regions. Her work simplifies the purification process on the front end of protein pharmaceutical production, so that the cell line is specifically developed for manufacturing. In addition to receiving a total of more than $1 million in research grants through the National Science Foundation and Arkansas Biosciences Institute, Brune participated in the graduate entrepreneurship certificate program at the U of A and participated on a team that built a business plan around her discovery. The team won $43,350 in prize money in graduate student business plan competitions. Boston Mountain Biotech has three employees: Brune, Ricky Draehn, chief executive officer; and McKinzie Fruchtl, director of fermentation. Draehn is a licensed professional engineer with more than 30 years of experience in the food and beverage industry. Fruchtl was a Doctorate Academy Fellow at the U of A who received a doctorate in chemical engineering in 2013.